The Comédie-Française (French pronunciation: ​[kɔmedi fʁɑ̃sɛːz]) or Théâtre-Français (IPA: [teatʁ(ə) fʁɑ̃sɛ]) is one of the few state theatres in France. Founded in 1680, it is considered the oldest active theatre company in the world. Established as a French state-controlled entity in 1995, it is the only state theatre in France to have its own permanent troupe of actors. The company's primary venue is the Salle Richelieu, which is a part of the Palais-Royal complex and located at 2 rue de Richelieu on the Place André-Malraux in the 1st arrondissement of Paris. The theatre has also been known as the Théâtre de la République and popularly as "La Maison de Molière" (The House of Molière). It acquired the latter name from the troupe of the best-known playwright associated with the Comédie-Française, Molière. He was considered the patron of French actors. He died seven years before his troupe became known as the Comédie-Française, but the company continued to be known as "La Maison de Molière" even after the official change of name. The Comédie-Française was founded on 8 August 1680 by a decree of Louis XIV merging the only two Parisian acting troupes of the time, the troupe of the Guénégaud Theatre and that of the Hôtel de Bourgogne. On the death of Molière in 1673, the troupe at the Guénégaud had been formed by a merger of the Théâtre du Marais and the Troupe de Molière. Two years later they received a royal grant of 12,000 livres per year; and seven years later they received their present designation. Thus the Comédie-Française may be said to have an unbroken tradition reaching back to the days of Molière. The company gave its first performance on 25 August 1680 at the Guénégaud. Its leading actors included Molière's widow, Armande Béjart, her husband, Guérin d'Estriché, La Grange, Mlle Champmeslé, Baron, Hauteroche, and Raymond Poisson. The repertoire consisted of the collection of theatrical works by Molière and Jean Racine, along with a few works by Pierre Corneille, Paul Scarron and Jean Rotrou. In the 18th century, the Comédie-Française was often enjoyed by the French nobility, since the price to watch at the theater was expensive. On the performance of Joseph Chénier's anti-monarchical play Charles IX in 1789, violent political discussions arose among the performers, and ultimately they split into two sections: the Republican party, under the young tragedian Talma, establishing a new theatre under the name "Théâtre de la République," on the site of the present building in the Rue de Richelieu; while the Royalist section took the title "Théâtre de la Nation." On 3 September 1793, during the French Revolution, the Théâtre de la Nation was closed by order of the Committee of Public Safety for putting on the allegedly seditious play Pamela, and the actors were imprisoned though gradually released later. On 31 May 1799, the new government made the Salle Richelieu available and allowed the actors to reconstitute the troupe. The Comédie-Française today has a repertoire of 3,000 works and three theatres in Paris (Salle Richelieu, next to the Palais Royal; théâtre du Vieux-Colombier; Studio-Théâtre). The Comédie-Française has had several homes since its inception. In 1689, it was established across from the café Procope. The Odéon was designed by architects Marie-Joseph Peyre (1730–1785) and Charles De Wailly (1730–1798). From 1770 to 1782, the Comédie performed in the theatre in the royal palace of the Tuileries. Since 1799, the Comédie-Française has been housed in the Salle Richelieu (architect Victor Louis) at 2, rue de Richelieu. This theatre was enlarged and modified in the 1800s, then rebuilt in 1900 after a severe fire. The membership of the theatrical troupe is divided into "sociétaires" and "pensionnaires." The former are regular members of the organisation and as such receive a pension after 20 years of service, while the latter are paid actors who may, after a certain length of service, become "sociétaires." The names of nearly all the great actors and dramatists of France have, at some time in their career, been associated with that of the Comédie-Française. The chief administrator of the Comédie-Française has been given the title administrateur général since Simonis' term of 1850. Before that, a variety of titles were given. ^ a b c d e Rines, George Edwin, ed. (1920). "Comédie Française" . Encyclopedia Americana. ^ a b Gilman, D. C.; Peck, H. T.; Colby, F. M., eds. (1905). "Comédie Française" . New International Encyclopedia (1st ed.). New York: Dodd, Mead. ^ Hartnoll 1983, p. 168; Clarke 1998, pp. 13–14. ^ Brocket & Hildy 2008, p. 195. ^ Hartnoll 1983, p. 169; Gaines 2002, p. 210 (Guérin), pp. 249–250 (La Grange). Brockett, Oscar G.; Hildy, Franklin J. (2008). History of the Theatre, tenth edition. Boston: Pearson. ISBN 9780205511860. Clarke, Jan (1998). The Guénégaud Theatre in Paris (1673–1680). Volume One: Founding, Design and Production. Lewiston, New York: The Edwin Mellen Press. ISBN 9780773483927. Gaines, James F. (2002). The Molière Encyclopedia. Westport, Connecticut: Greenwood Press. ISBN 9780313312557. Laugier, Eugène (1853). Documents historiques sur la Comédie-Française pendant le règne de S. M. l'Empereur Napoléon Ier. Paris: Firmin-Didot. Copies 1, 2, and 3 at Internet Archive. Maurice, Charles (1860). Le Théâtre-Français, monuments et dépendances, second edition, revised and enlarged. Paris: Garnier. Copies 1 and 2 at Internet Archive. Sanjuan, Agathe; Poirson, Martial (2018). Comédie-Française: une histoire du théâtre. Paris: Éditions du Seuil. ISBN 9782021343755. Wikimedia Commons has media related to Comédie-Française. The Palais-Royal, originally called the Palais-Cardinal, is a former royal palace located in the 1st arrondissement of Paris, France. The screened entrance court faces the Place du Palais-Royal, opposite the Louvre. In 1830 the larger inner courtyard of the palace, the Cour d'Honneur, was enclosed to the north by what was probably the most famous of Paris's covered arcades, the Galerie d'Orléans. Demolished in the 1930s, its flanking rows of columns still stand between the Cour d'Honneur and the popular Palais-Royal Gardens. Victor Louis was a French architect, disqualified on a technicality from winning the Prix de Rome in architecture in 1755. Michel Baron was a French actor and playwright. Hôtel de Guénégaud refers to one of several 17th-century hôtels particulier, or large townhouses, in Paris. La Grange, whose real name was Charles Varlet, was a French actor and a member of the troupe of Molière. 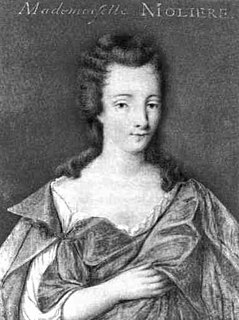 Armande-Grésinde-Claire-Élisabeth Béjart was a French actress, one of the most famous French stage actors of the 17th century. She belonged to the Béjart family, a famous theatre family in 17th-century France. She was the daughter of Madeleine Béjart. In 1643 her mother Madeleine co-founded, with Molière, the theatre company called Illustre Théâtre. Catherine Leclerc du Rose, also known by her stage name Mademoiselle de Brie', was a French actress. She was a member of the pioneer troupe of both the Molière's company, and of the Comédie-Française. She belonged to the first Sociétaires of the Comédie-Française. The Théâtre du Palais-Royal on the rue Saint-Honoré in Paris was a theatre in the east wing of the Palais-Royal, which opened on 14 January 1641 with a performance of Jean Desmarets' tragicomedy Mirame. The theatre was used by the troupe of Molière from 1660 to 1673 and as an opera house by the Académie Royale de Musique from 1673 to 1763, when it was destroyed by fire. It was rebuilt and reopened in 1770, but again was destroyed by fire in 1781 and not rebuilt. The Salle Richelieu is the principal theatre of the Comédie-Française. It is located in the Palais-Royal in the first arrondissement of Paris and was originally constructed in 1786–1790 to the designs of the architect Victor Louis. It seats 862 spectators. The Salle de la Bouteille or Salle du Jeu de Paume de la Bouteille, later known as the Hôtel [de] Guénégaud or Guénégaud Theatre, was a 1671 theatre located in Paris, France, between the rue de Seine and the rue des Fossés de Nesle across from the rue Guénégaud. It was the first home of the Paris Opera and in 1680 became the first theatre of the Comédie-Française. Georges Berr in Paris, was a French actor and dramatist, a member and sociétaire of the Comédie-Française from 1886 to 1923. 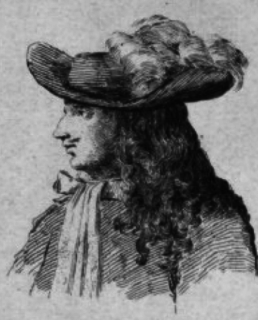 Raymond Poisson (1630–1690) was a French actor and playwright of the 17th century. Mainly a comic actor, he used the stage names Crispin in comedy and Belleroche in tragedy. François Le Noir, sieur de La Thorillière was a French comic actor, who was born and died in Paris.